The demand for well-trained Hypnotists has never been higher. Helping clients overcome their deep-rooted phobias, learning to be at peace with themselves, discovering that they can overcome self-destructive habits, all bring a lot of satisfaction to hypnotists, while also providing a good income and lifestyle. Discover for yourself if becoming a professional Advanced Hypnotist is for you. We have produced 5 in-depth modules, which walk you through advanced hypnosis techniques. Dr. Steve G. Jones has over 20 years experience as a certified clinical hypnotist, both teaching hypnosis students and working with clients. Dr. Steve G. Jones has a Bachelor of Science (B.S.) degree from the University of Florida, a Master of Education degree (M.Ed.) from Armstrong Atlantic State University, and a Doctorate in Education degree (Ed.D.) at Georgia Southern University. He is a certified clinical hypnotherapist, a member of both the American Board of Hypnotherapy and the National Guild of Hypnotists, president of the American Alliance of Hypnotists, and director of the Steve G. Jones School of Hypnotherapy. Detailed InstructionThis course covers a review of basic hypnosis techniques, pendulum for pre-hypnotic diagnosis, post-hypnotic suggestions, metaphors, analog marking and phobias. This is a 2-12 month or 8-52 week course that gives you 120 hours of quality instruction. Backing by a Professional OrganizationGraduates of this program receive certification from the American Alliance of Hypnotists (aah.localhost). Access to Your InstructorYou can email Dr. Steve G. Jones directly! Proven Track RecordWe have an extensive list of graduates of the American Alliance of Hypnotists who have completed the Hypnosis Certification Program, practicing around the world from Alaska to Australia, all trained by the founder, Dr. Steve G. Jones Ed.D. SEO Listing of Your BusinessOnce you graduate, you will be listed in the directory of our top-ranked American Alliance of Hypnotists website (aah.localhost), making it easier for clients to find you. You will also be able to add a clickable link to your email and website. Lifetime SupportYou can email alumni support anytime and they will provide you with any hypnosis scripts that you need. For example, if you are working with a client and you need a script on weight loss, motivation, smoking cessation, confidence or wealth building, simply email alumni support and they will send you a script to use. Training MaterialsOnce you are enrolled, you will have access to a special student-only area where you can enter you password and access videos, audio and past student work. The Ability to Make MoneyYou’ll receive the Business Guide for Hypnotherapists in which you will learn how to turn your new skills in a business. According to the Wall Street Journal (Degrees of Value: Making College Pay Off, January 4, 2014), Georgia Institute of Technology is now offering an entirely online master’s degree in computer science. If they’re offering an online master’s degree, that says a lot about how much they trust the ability to deliver online education in a reasonable way. 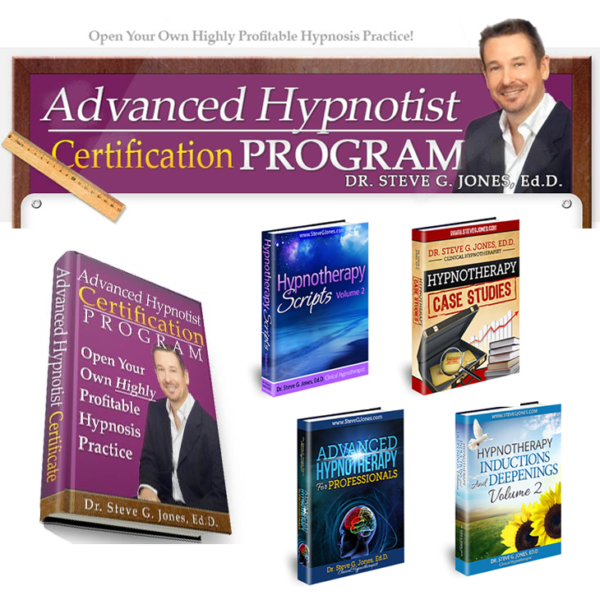 You may decide you don’t want to be a professional Advanced Hypnotist, but rather you want to learn self-hypnosis to break negative cycles, and have unlimited confidence. You will also learn how to hypnotize your friends and family. Dr. Steve G. Jones strips out all the unnecessary time-wasting filler & just presents to you all the pertinent information you need to practice safely, successfully and professionally. 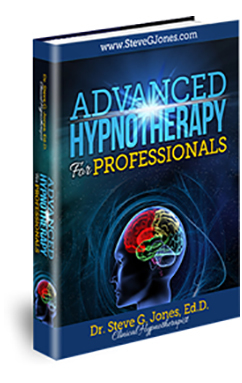 By completing this course, you will also have lifetime support from Dr. Steve G. Jones and the American Alliance of Hypnotists. 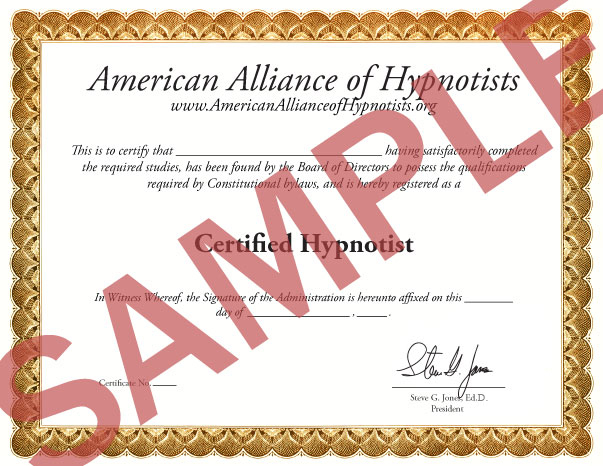 Upon certification, you will be permanently listed in The American Alliance of Hypnotists’ approved Hypnotists list. According to a 2014 Best Online Programs Rankings report released by U.S. News and World Report, nearly 1,000 distance education programs are now available offering bachelor’s degrees and online master’s degrees in engineering, business, education, nursing and computer information technology. respected education providers are offering bachelors and masters degree programs to online students, without them having to ever enter a brick-and-mortar campus. Upon registering, the entire program will be sent to you via e-mail. You can work at your own pace. You will perform the practical homework and e-mail back the entire program when completed for grading. During your training, you will be able to ask any questions by e-mail. You will review the basic hypnosis course and the parts of a hypnosis session: pre-talk, induction, deepening, script, amnesia and trance termination. examining the client’s otherwise undetectable physical response to questions. A post-hypnotic suggestion is a suggestion given to a client while they are in a hypnotic state. This suggestion is acted upon when the client is not in hypnosis. They are different from general suggestions in that they are specific commands for specific actions or perceptions. They can be triggered by words, actions, or as a result of time. Hypnotic metaphor is one of the most elegant tools available for assisting people in the process of personal transformation, healing and growth. The major purpose of hypnotic metaphor is to pace and lead an individual’s experience through the telling of a story that helps that individual access resources necessary for change. Analog marking means adding emphasis to a word or phrase. This is usually done with an unobtrusive gesture, facial expression, or a touch to emphasize certain words non-verbally as you are talking to someone. The marked out words give an additional message. In this module, you will learn how to help clients with fears. Upon completion of the course, you will want to demonstrate your new powerful abilities. This is a chance for you to do just that. On the last page of your course manual, you will find a personal login code where you will go online to take a multiple-choice exam and submit your homework and essay for Dr. steve to review. How to make the leap into practicing hypnosis full-time. How to setup a hypnosis practice in your home. As you progress through the Advanced Hypnosis Certification Course, you will be required to do homework along the way. In the Online Student Resources section, you will find a robust library of helpful resources. For example, homework examples are provided, which you can use to model and practice with as you develop your own. American Alliance of Hypnotists. You will then be ready to launch your career in hypnosis. Prerequisites: The Basic Hypnosis Certification Course is highly suggested. IS for everyone. Even if you are a layman with no hypnosis background, or don’t want to be a professional advanced hypnotist, you should still take this course. You will learn self-hypnosis to break negative cycles and have unlimited confidence. You will also learn helpful techniques to hypnotize your friends and family! And, if you are a professional, this course will take you to the next level! Upon completion of your training, you will be certified by the American Alliance of Hypnotists to practice advanced hypnosis. Please check your state/local guidelines for specific licensing requirements. Most states in the US do not require a specific license to practice hypnosis. We stand 100% behind our programs and courses. Q: I have no prior experience as a hypnotist, do I need any prior experience? A: Dr. Steve highly suggests you take the Basic Hypnosis Certification course before taking the Advanced Hypnosis Certification Course. Q: Does this course teach self-hypnosis or hypnosis? A: This course teaches advanced hypnosis techniques that you can use to help other people. You will be able to apply what you have learned if you wish to use self-hypnosis. Q: How exactly is the course conducted? 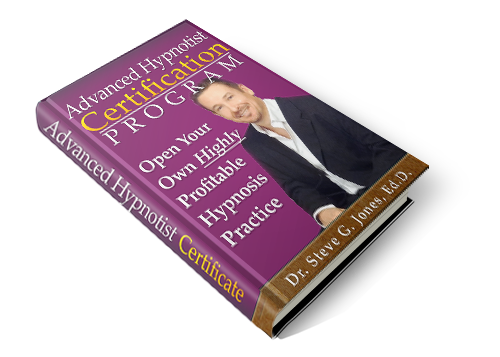 Advanced Hypnotherapy for Professionals- Hypnosis Book by Dr. Steve G. Jones, Ed.D. 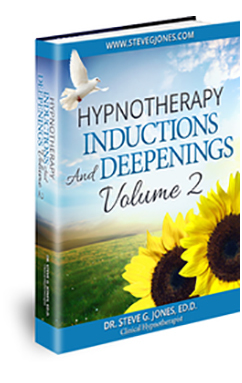 Hypnotherapy Inductions and Deepenings Volume 2 – Hypnosis Book by Dr. Steve G. Jones, Ed.D. 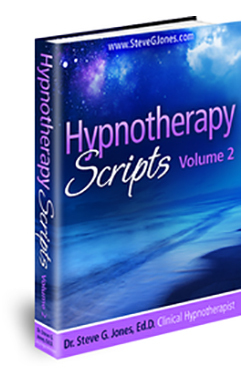 Hypnotherapy Scripts Volume 2 – Hypnosis Book by Dr. Steve G. Jones, Ed.D. 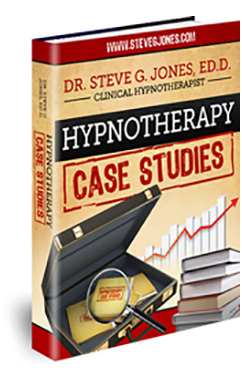 Hypnotherapy Case Studies by Dr. Steve G. Jones, Ed.D. Q: How many modules and exams are a part of this course? How long are we given to complete them? A: The course consists of 6 modules with the 7th module being the final exam. It generally takes 1 week for students to complete a module, but you can go at your own pace. Module 2-6 have homework that must be completed. You will submit your homework at the end of the course by uploading it online for Dr. Steve to review. Q: How is the final exam conducted and how long do I have to complete it? A: On the last page of your course manual is a private registration code you will use to register for the online exam. The multiple-choice exam consists of 19 questions. You must get 75% correct in order to pass the multiple-choice portion of the exam. You will have 3 attempts to pass. If you fail 3 times, you will be locked out of re-taking the exam for 60 days. You will then get another 3 attempts. Upon passing the multiple-choice exam, you will then need to upload your course homework. You must also submit an essay. Dr. Steve will review all of your work at one time. Please allow one week for him to review your material. Q: How long after completing the program will we receive our results? A: You will automatically learn whether you passed or failed the multiple choice portion. Once you pass the multiple choice exam you can submit your essay and homework. Please allow Dr. Steve one week to review your submitted material. You will be notified via email whether you passed or failed. Q: I understand that the class is a minimum of 8 weeks. What if I would like to complete the class in a shorter time period of 8 weeks? A: If you want to complete it in shorter than 8 weeks, simply follow the instructions on the last page of your course manual. 8 weeks is only a suggested time period for people to pace themselves in a stress-free manner. We welcome course work turned in prior to 8 weeks. Q: Some programs I have seen online are 300 hours or more. This training is much shorter. Is it just as good as those other programs? A: Yes. 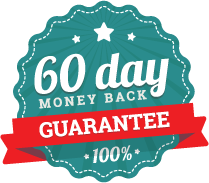 In fact, this program is superior to any other hypnosis training currently available. In our extensive study of other training programs, we have found that the majority of programs available waste a considerable amount of time training hypnotists to perform procedures, which are generally reserved for licensed professionals such as psychologists or psychiatrists. Aside from creating a legal liability for the hypnotist, these programs also waste the money of the unsuspecting hypnosis student. Q: Will I be properly trained if all I take is your Online certification program? A: Ideally a hypnotist would be trained in a classroom setting with an instructor physically present. Unfortunately, this luxury is not practical for many people. When we factor in airfare, hotel, time away from work and family, etc. the costs both monetary and otherwise quickly add up. For this reason, many institutions have turned to Online training as a viable alternative to meeting modern day needs. In fact, Columbia, Harvard, and Cornell have extensive Online programs. Also, Penn, Dartmouth, and Yale offer Online classes. Dr. Steve G. Jones, while working on his doctorate in education, extensively studied the Online programs offered by Ivy League schools. He then was able to model the hypnosis training program to offer a similar level of training. Q: Will your certification be accepted in my state (any state in the US)? Q: Is this the only training I will need for my state? A: Yes, this is the only training you will need in order to call yourself a certified hypnotist. However, you are encouraged to see our list of states in the United States that have regulations concerning hypnosis and you are also advised to seek legal advice when in doubt. Q: Will your certification be accepted in my country (any country other than the US)? A: Yes. Most countries other than the US do not regulate hypnotists. To be certain, be sure to check with your local guidelines. Q: When I complete the program, what will my title be? Q: Which organization grants the certificate and certifies my training? A: The American Alliance of Hypnotists. Q: I live outside the US, is this training still valid for me? A: You are encouraged to research the laws in your area. We do not have a list of legal requirements by country. We do however have graduates of this program practicing in many countries around the world. If you live in Ontario, Canada, we do have a document that will give you some guidance. You can find it here. Q: Is the certification recognized by any universities? A: Although our program is taught in several universities and the main text book, Basic Hypnotherapy for Professionals, is a class text book designed for classroom instruction, we are not aware of any universities that recognize credits for this program. A: Upon completion of this program, you will receive a beautiful certificate via email, which you can print out and proudly display for your clients to see. It will have your name, title (Certified Advanced Hypnotist), and your certification number. A: No, we do not ship physical certificates. A digital PDF is the only certificate you will receive. A: The program is taught online and in person by Dr. Steve G. Jones. Steve personally trains every student whether online or in a classroom setting. Q: What are Dr. Steve G. Jones’s qualifications as a hypnotist and as an instructor? A: Dr. Steve G. Jones has over 20 years experience as a certified clinical hypnotist, both teaching hypnosis students and working with clients. His list of former clients includes: Danny Bonaduce, Jeraldine Saunders (creator of the Love Boat TV series), Tom Mankiewicz (writer of Superman the movie), and many other celebrities. Dr. Steve has served on the board of directors of the American Lung Association in Los Angeles, California. He is a member of the National Guild of Hypnotists, National Board of Certified Clinical Hypnotists, founder of the American Alliance of Hypnotists, member of the International Registry of Clinical Hypnotists, has presented his hypnosis research at the American Council of Hypnotists Examiners, received the President’s appreciation award for his outstanding contributions to the American Association for Adult and Continuing Education, is a member of the American Board of Hypnosis, member of Who’s Who among Students in American Universities and Colleges, recipient of the National Leadership Award from the United States National Congressional Committee. Dr. Steve received his Bachelor’s degree in Psychology from the University of Florida, received a Master’s degree in Education from Armstrong Atlantic and State University, received the Educational Specialist degree from Georgia Southern University, and is currently a Doctoral candidate in Education at Georgia Southern University. Dr. Steve has recently been featured on TruTV, CNN, and is under a development contract for his new television series on hypnosis. Q: Do I need an advanced degree to practice hypnosis, such as a bachelor’s degree or a master’s degree? Q: Does the American Alliance of Hypnotists help its hypnotists by promoting them online? A: Yes. You will be listed on the international Online list of Certified Hypnotists. Q: Can I ask former graduates what they think of the program? A: Yes. 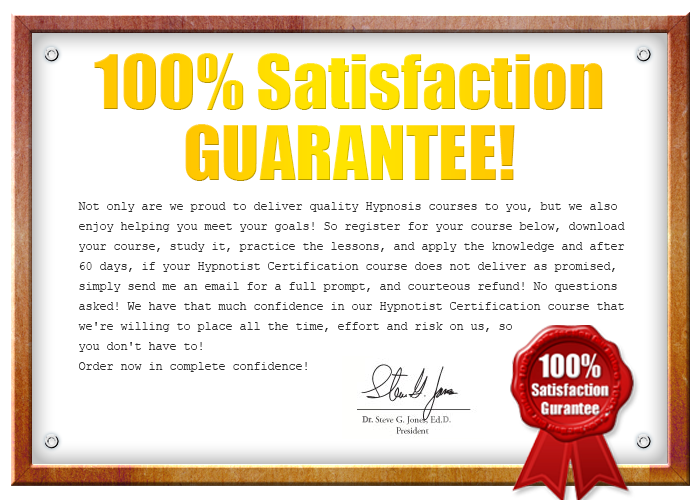 Feel free to contact anyone on the online list of Certified Advanced Hypnotists. Q: I am a layman with no hypnosis background. Will this program actually take me from the ground floor up and teach me everything I need? A: We suggest you start with the Basic Hypnosis Certification Course.